Try Children Worship & Wonder for children age 3 through 2nd grade. Beautiful age appropriate “worship” and involves telling the stories of God to the children of God. Contact DHM Christian Church Disciples of Christ. Jane you must not of understood the article.It is ok for children to set in church with adults some time. Wonderful message! We agree and sent it to our priest (Episcopal) as he also talked about the children in church in his sermon today. Wishing you the best in your new position! From your OLD neghbors, now living in lower AL, where it stays pretty warm! At our church, the pastor puts up relevant pictures of the sermon periodically as he goes through his sermon text. The kids have the option of drawing the pictures or coloring predawn ones on provided sheets. Also, each child had their own binder with a pouch of crayons they can use. With consistent and gentle training, my 6 kids, 2-13, can easily sit in church every Sunday. We get to start again with another baby this fall!! Of course all things depend on the child -the pastor -the parents & the Children’s programming.My Children’s Programs is Biblical and age appropriate and If families want to worship together at this time the patents should join the children.Many Children have given their life to Christ during Children’s Church and get to ask questions when they are thinking about them right then. I don’t know any Big church services that would encourage group discussion during and give definitattions of words during surmons.Do You? Children take words literally and need further explanation.They may not know what repent means -or trinity.Shoot I can think of a lot of people that would benefit from coming to Children’s Church for awhile and having a little more one on one time with worship along with a quick snack.and doing an activity to reinforce that lesson is proven to double your chances to remember that material.Even Teachers know that. All fine and good unless you have a special needs child. Try getting a child with autism to sit still and be bored. It will result in tantrums and meltdowns and lots of disruptions. I have two austic children who sit quietly during church 12 and 13. Lots of training, they seem to have more trouble in youth service because of the high energy. A teenager with cerebral palsy (He’s in a set of quints.) Had attended with me and my church since his birth. He has still has outbursts and noises, but it makes my heart happy to hear his excited sounds when he gets to lead his favorite song with his family. I figure if can sit through church, I have little excuse not to. I asked his dad once how he does so well. His response was simple and astounding–they treat him just like his siblings. Sure, he’s going to have his fighting moments where he leaves for a few, but they consistently bring him back and demonstrate what to do. The noises and disruptions don’t bother us; I’m happy to see the church of today participating in church. We do have Sunday School before church, which is akin to Children’s Church. Now, I’m an aunt, and keeping toddlers calm is sometimes like wrestling an octopus, but if they can stare at a screen for 30 minutes, they can stay within the confines of a pew with crayons for 30 minutes. I’m a grandmother now and as a young mother we attended small churches that didn’t have children’s church. So I’m very familiar with keeping the kids quiet, standing in back rocking the baby, etc. I Sunday school all the material is age appropriate, so I’m a little confused by the arguments that ‘ kids are picking it up’. Why provide it in Sunday school if it doesn’t matter? My other point for joining this conversation is – what about seeking families. It’s all well and good for dedicated, strong Christians to think out how they want their children to be taught spiritual things. But what about the single mother with 3 kids under 5 who somehow heard that Jesus loves her and came to hear more? What do you tell her? Certainly the sign of growth everywhere is new life, and that’s what kids are. I believe every effort should be made to bring in more, welcoming, making room, giving resources – making it a place kids want to come to AND invite their friends to. My husband and I have led Children’s Church services for more than 30 years. Yes, some children do fine in an adult service, but some thrive in a more age-appropriate setting. Our third child was highly ADHD and would have been disruptive in the adult service; he thrived in the loving children’s setting. Our youngest child is autistic is autistic and could not have sat through a regular service until about age 12. Our other kids would have been fine with it. I like for a church to have options and let the parents decide what is best for each child. Dang, Melissa. You think Matthew McConaughey sends his kids to children’s church. Also, I will now refer to your husband as Pastor Boring. You are so real and God is using you to touch so many people!! !I feel blessed to know you GREAT JOB !!! Perhaps the problem isn’t so much that kids are bored, but that kids aren’t taught how to deal with boredom properly. I think that depends on various factors. I’m a 27-year-old with attention issues stemming from ADHD and Asperger’s Syndrome so my mind is prone to wander during service. It’s incredibly easy for me to get bored in church because I’m not getting the same mental stimulation I get from my stocking job (which provides that kind of stimulation). Most preaching methods don’t take mental illnesses into account because they assume everyone has good mental health. I’m able to bring my focus back from time to time throughout the service and God knows my struggle. I can’t do anything to “fix” how my mind operates and I don’t think either of my illnesses are severe enough for medication. I just need to find a method that allows me to focus during an hour that makes disconnection very easy. I also have problems with my mind wandering, often, during a sermon. Sometimes the Holy Spirit is speaking something to my heart that I need to pay attention to, and when that is the case I just go with the flow of my thoughts until the Lord brings me back to the preacher. ..but when I’m just having a hard time paying attention, then I take notes to help keep me on task, and to help my retention of what is being shared. Hi! I am also a pastor’s wife, and I feel very strongly that Sunday morning worship should be inclusive of all ages. I highly commend to you the book “Children in the Worshiping Community” by Ng and Thomas. I think you will find it refreshing and inspirational. Blessings to you! I quite often draw or doodle during church (and class lectures.) For some of us, it’s a way of concentrating. I think it’s important for kids to be allowed to occupy themselves quietly during church. I didn’t have ipads etc for my kids when they were small, so technology was never an issue for us. I’m grateful for the time they had in “children’s church” where they got the lessons and teaching that was appropriate to them at that time, and for the family worship we enjoyed during services that were deliberately created to include all the age groups. While I agree that not every part of church is for every person- I may like worship music better, while someone else may enjoy the sermons and so on, I do think it’s not a bad thing to consider the various ages present and include a wider variety in our services. Not every service should cater specifically to children, or every part of a service, but neither should children be overlooked. All are called to worship, and we should make room for all ages. I am a former children’s Pastor and I agree with this post 100%! Great post! I must say, that is one thing I NEVER worried about! When I was a child, we went to church as matter-of-fact-ly as we ate breakfast or supper; it was simply a part of life! I treated it the same way with my kids. I think this is wonderful. To all those who seem almost defensive or offended siting the single mom newly converted or the special needs children I would suggest a second part to this post that calls the church to celebrate family the way God intended. So that Pastors talk a little louder if needed and church members reach out and love on others. If you see a mama in need sit by her love on her kids. If there is a family with children with needs other than the service come together as a church to bless that family. If a baby cries avoid turning around and glaring at the mom. Training your children is hard and takes time but so worth it. This is part of that. If they are being taught at home this is an extension of that. If they aren’t being taught about Jesus at home then the church needs to come together around that family and encourage them on. A Sunday morning kids service won’t remedy that if the home is not growing in a way that a loving church body couldn’t help as well. If you choose the children’s church route that’s fine too. I would ask this though… are the parents involved? Are we equipping these new to the faith parents to take up the cross of discipling their own children, are we tending the spiritual needs of those teaching the class? Do those adults (called though they may be) feel supported or like they are in ministry alone and in need of care themselves? These are just my observances and I am newer to the faith as well. Jesus involved children he didn’t send them away. The bible instructs parents to teach their children. I guess I just feel like we are putting our priorities out of order. Are we dealing with the heart of the matter or putting on a bandaid for a whole other issue. 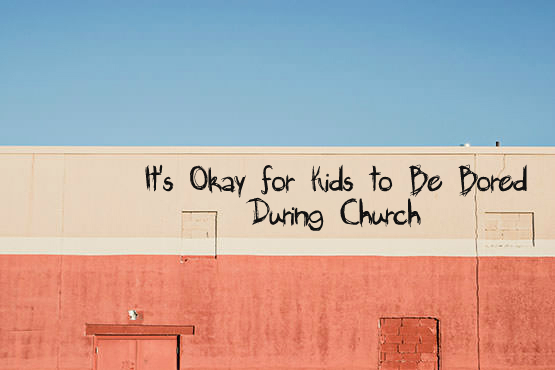 Actually, studies have shown that when children do not have the special programs and take part in the worship service and normal functions of a church, they are much more likely to go on and be members of church as adults. We wonder why we are losing our children when they grow up, and I believe this is one reason why. Our church does children’s church year around. My son (3) learns a TON more than he would in-service. I know some parents that have huge power struggles with making their kid sit still in church. I think that’s ridiculous. Let the little children learn about Jesus’ love in children’s church rather than learning about mommy’s ire in a hard pew in regular service. Bored or not bored that’s not the issue. The issue is what do you do in your church to make sure your children enjoy church and get learn about the truth about Jesus. If you don’t care to think and plan anything for your children it is ok. But if you just put thought into do something with them to help them grew and enjoy church you will be much more successful church. Jesus care for the children, we should to. My wife and children went to church for awhile before Christ brought me in, when I first joined them I found they sat right down front, very odd for Presbyterians. I got used to sitting in the second row watching most of my children in the first row. One Sunday I noticed my oldest son was reading during the sermon, and as I watched noticed he was playing a game with one of my daughters..I figured he was probably to young to get much out of the sermon and let it go till mid week when he asked an in depth question on a nuance from the sermon. The book he was reading at the time? The Bible. Our church has childrens church year round as well but on the first sunday of the month they do not because it is a time for childrens church teachers a break for them to get to sit in church, on that first sunday the children sit with their parents. When my girls were that young I used to take christian coloring books and crayons and had no problem with them sitting still. When they got bored with that I had paper and pencils they could play tick tac toe or dots. I have always sat in the second row with them because I have ADHD and am easily distracted myself from movement ahead of me, but with sitting in the 2nd row I am not and am easily able to enjoy the service. The only ones usually that sit in the front row are the deacons on the last sunday of the month when we do communion. My girls are 23 and almost 26 now and they have no problem talking about how god watches over them. Really liked your article. Can we translate in French for our website ? We’d give full credit (name and link to your blog). Of course, Aurelien! Thanks for checking with me! A long time ago, a church member, who was a guidance counselor told me, “It’s okay for children to be bored. Being bored is a social skill that children need to learn.” As they grow up and go out on their own, they are going to be bored in lots of situations–boring family gatherings with their in-laws, boring meetings in the workplace that they will be required to attend, boring classes in school that will be required for their degree, and lots more. And–kids pick up more than you think, even when they appear to be bored. In my opinion, the ideal is a church we used to attend. Up to 5th grade, kids would sit in church, worship, then were taken out to hear an age-appropriate Gospel message– “Show Me Jesus” lessons. Then, they were brought back to finish worship service with parents. Also agree w/comment re: special needs kids. I can’t tell you how many times I just gave up trying to get anything out of the service bc my kids were fidgeting, asking me questions, etc during prayers, sermon, etc. I’d rather not hear “I have nothing to do” multiple times during the sermon. And, it seems to work contrary to the desire for them to want to be there. They are learning nothing just playing w Legos. Also, an hour+ of boredom just makes it harder on parents to get them to want to go. I remember how bored I was as a kid, and I never got anything out of it, except a great memorization of hymns, word for word. It wasn’t until later in life when I actually understood the gospel and was old enough to have the attention span for a sermon (I.e. What can seem to kids like a collegiate-level educational “lecture”), that I began to truly get it. I don’t think you can make a blanket statement about this issue. I liken it to saying “It’s ok for kids to eat vegetables instead of candy.” Yes, it’s ok, but it’s an uphill battle. My 2 cents. The conversations I’ve had with kids I’ve taught over the bible ,about school about their worries and concerns …the individual prayers and time with God together has been precious…you can’t do this in a service as readily…. So I think it’s helpful to have groups to cater for younger children …but it’s down to parental choice…. It is very important to us that our children sit wit us in church and learn. The 9 year old takes notes, the 7 and five year old listen, the 4 and 3 year old sir quietly and we keep the 6 and 1 year old very close, occasionally going into the hallway to learn to sit quietly in an even more boring environment, they would much rather be in service! The 6 month old nurses a lot through service. We discuss the sermon again at home. The children get to hear mom and dad were attentive and if they have any questions or new vocab, we discuss it! Often our nine year old’s notes help fill in any gaps in the sermon I might have from teaching the others how to sit quietly. A wonderful way for the church to help the single mother would be to come along side her and say, I see and commend you for teaching your children to sit in service, if ever you need an extra hand, one of your little ones is welcome to sit with us! I wholeheartedly agree with your article. Children’s Church or Sunday School has become a baby sitting program. I have seen so many go through these programs as children only to grow up and walk away from faith in Christ. As I look back and think about these souls, it would have been much more beneficial for them to be bored out of their brains but listen to bible based sermons, than to be entertained with kids programs. It’s the job of dad and mum to teach their children bible stories and truth applications, and it’s the preachers job to expound truth and doctrine from the pulpit for the whole family to hear. I’d never sat a day in children’s church. I don’t believe it is necessary. I grew up listening to sermons meant for adults, would go home and ask my dad questions, and DID pay attention to as much as my little mind could handle, in short attention spurts. My daughter is the only child in our small church. We get children visitors during the summertime, but we don’t need children’s church. We have Sunday School for children that come to Sunday School, we have a nursery for little ones, and that’s it. I learned a lot from Sunday school, growing up, and by the time I was 10 I understood the deeper theology of the Bible based on the preaching that happened each Sunday. I don’t remember each sermon, nor can I remember the sermon from last week, but it is enough to sustain me, just like the physical food I eat daily. I’m what they call a “seasoned” pastor and Christian educator, and I have noticed the same things:-) There was one adult in my home congregation that filled in all the letters — you know, like e’s and a’s and o’s because that helped her to focus on the sermon. I would love to reprint your article, with your permission and of course with attribution, as we are having a Christian ed Sunday this week. Would that be okay? Of course, Vivian! Thank you for your comment! I go to a church that provides nursery until age 3. As a mother of two who attends church by herself with the kids because of my husband’s work schedule it is such a blessing not to have to watch my almost 3 year old and actually being able to focus on the sermon. I dread the time when I will have to have him in the service once he turns 4. I am driving for 1 hour to hear good preaching, but whenever I have the younger one with me in service/bible study I don’t get a lot out of it. Maybe this is selfish, but I am wondering how I can teach my children if I am not being taught myself because I have to make sure they stay quiet in church. My youngest one is also high energy. I was also thinking about staying in the foyer where I can listen to the sermon, but the kids can still play. I am open to any suggestions. I am intrigued by this article, as I’m not happy with my church’s Sunday School program, particularly the new timing of when the kids leave for SS. We’ve been members at this church for 11 years, and this is the second school year in a row where the children sit through the sermon (long). My 14-year old can certainly handle it, but my 10-year old is bored out of his gourd. Yes, I realize that this article is about the fact that it’s OK to be bored. I’m just feeling not in love with our beloved church right now, as waiting to leave for SS until AFTER the sermon has drastically cut down the kids’ time in school, learning lessons that are appropriate for their age level. Last week, the kids were in school for 20 minutes. 20 minutes does not give one time to get through the entire, valuable lesson. I know, because I teach. I am just frustrated, as I do not see the sermon as time well-spent for the younger kids whatsoever. I’m being honest here, because I’ve been so frustrated. Nothing has changed after airing my concerns more than once, because “studies show…” blah, blah, blah. As a side note, after the kids are dismissed for school (ages 4-6th grade only), the kids gather together as a whole group to sing silly songs, so Sunday School time is really only about 15 minutes. Again, not valuable. The same kids are getting music lessons on Wednesday choir days. I’m just looking for a place to air my frustrations. Perhaps you can sway me to lovin’ this kids-sitting-through-sermon-thing. I don’t want to leave our beloved church, but I feel like my kids’ church school education is lacking right now…more so, my 4th grader’s. Anyone? Ugh.